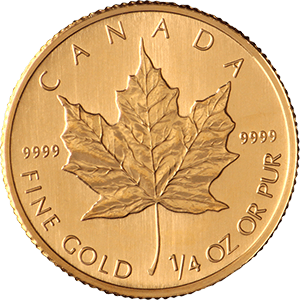 The 1/4 oz Maple Leaf Gold Coin is a part of a series of bullion coins released by the Canadian government through the Royal Canadian Mint in 1979. One of the first mints to compete with the ever ubiquitous South African Krugerrand, it quickly became a popular item for both collectors and investors alike. The 1/4 oz Maple Leaf was first introduced in 1982, with only the 1 oz version available from 1979. It should be noted that the 1 oz coin before 1982 was 22 carats, while all Maple Leaf coins after this date are 24 carats. It soon became popular with smaller investors due to its relative affordability, and six different weights are now available. 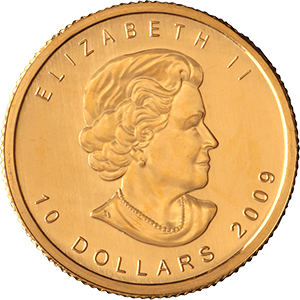 The 1/4 oz Maple Leaf has a face value of $10, but the gold content alone makes the coin many times more valuable. The design has changed little over its almost forty-year lifespan, with Queen Elizabeth II on the obverse and the iconic maple leaf on the inverse. There have been three versions of the figurehead Queen Elizabeth, starting in 1979 with the 39-year-old monarch. Between 1990 and 2004 it depicted the 64-year-old queen and from 2005 until this day, the 79-year-old portrait. The 1/4 oz Maple Leaf weighs 7.802g and has a diameter of 25mm. There have been several special addition Maple Leaf coins over the past four decades, most notably the 25th anniversary edition, a boxset that included all six versions for collectors. Other special editions include many versions of the 5oz, $100 and $200 Maple Leafs. These were limited edition releases and very popular with collectors. Special holographic, coloured and Olympic editions, for the Vancouver Winter Games, were also released in limited numbers and quickly snapped up by collectors.